If interested in Learning to Play Hockey, please visit our Hockey page. 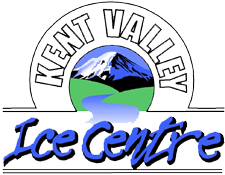 Each eight-week series costs only $162.00 (+ $10 if register day of first class) and includes one 30-minute class each week on Tuesdays or Saturdays, admission to the public session after each skating class and a certificate showing you completed our program. The prepaid skate rental is $26.00. Skating is more than just a fun pastime; it's also a great way to get in shape. 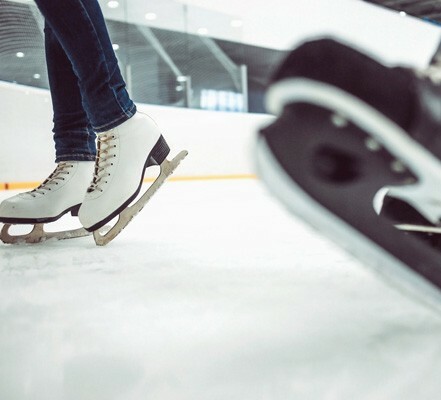 Ice skating builds endurance, strengthens muscles, and increases flexibility while burning around 250 to 810 calories an hour during a recreational session and 450 to 1080 calories an hour during a competitive session. We recommend you dress in warm, comfortable clothes that allow you to move freely. Dress in layers, so as you warm up, you can remove your top layers and still stay comfortable. Helmets are highly recommended for children 6 and under as well as first-time adults. 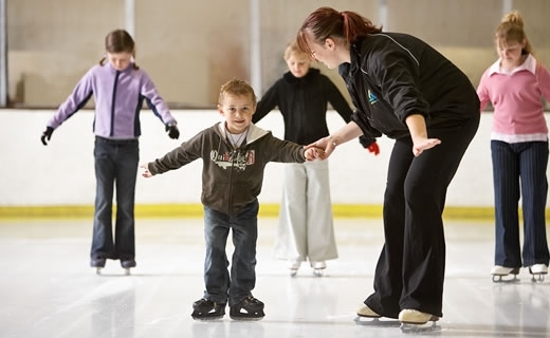 Be sure to arrive early to each class to give yourself plenty of time to get your skates on and meet your teacher a few minutes before the class starts.